Heading into the World Series, most baseball pundits (and other various media types) predicted a very competitive series, likely going 6 or 7 games, but very few gave the Phillies a chance to win. Most showed respect for the defending champions, but figured the Yankees to be too much of a powerhouse for the Phillies to prevail. Cliff Lee and Chase Utley may have grabbed the attention of the Yankees and the media by leading their team to a 6-1 series opening victory, and possibly made both believe (or should we say "beLeeve") that they have what it takes to win. Last night's pitching match-up pitted best friends, former teammates and respective aces against each other. The experts' assessment and expectations of the match-up mirrored their overall assessment, with most seeing CC Sabathia as having the edge. Instead, it was Cliff Lee who put on a masterful pitching clinic, while new teammate Utley chased Sabathia with two solo shots into the misty October air. As Phillies fans quickly learned this summer, Lee should not be under-estimated as he has the ability to dominate his opponents with surgical precision. The tone of last night's game was set early, and Lee maintained control from start to finish. In the first inning, although the Phillies did not score, they loaded the bases and made Sabathia work hard to escape trouble. Conversely, in the bottom half, Lee quickly dispensed the Yankees, striking out home town heroes Derek Jeter and Mark Teixeira along the way. In the 3rd inning, Utley jolted Sabathia, who appeared to be settling in, with his first home run of the night. He lifted a fastball a couple rows into the right field bleachers. He struck again in the 6th inning, this time launching a bomb deep into the right-center stands. Other than those two hits, both pitchers were cruising, setting down batter after batter, with one difference. Lee was pounding the strike zone, while his counterpart was forced to rack up a high pitch count. Yankees Manager Joe Girardi opted to go to his bullpen to pitch the 8th with Sabathia having already thrown 113 pitches, and the Phillies took advantage by tacking on runs. Three walks and Raul Ibanez's 2-run single increased their lead to 4-0 in the 8th. 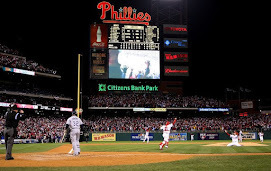 They rallied again in the 9th inning, using singles by Jimmy Rollins and Shane Victorino, along with doubles by Carlos Ruiz and Ryan Howard to plate a couple more runs. Despite having a commanding 6-0 lead, Charlie Manuel sent Lee back out for a chance to complete the shut out. Jeter blooped a hit to center and Johnny Damon lined another hit to right. Teixeira bounced a ball up the middle that Utley grabbed, flipped to Rollins for a force, but the ensuing throw went into the dugout, allowing Jeter to score. Lee then shut the door by striking out Alex Rodriquez and Jorge Podada to end the game. If not for the throwing error, Lee would have gotten credit for a complete game shut out. Despite the minor blemish of an unearned run, Lee pitched a true masterpiece, dominating the highest scoring team in the majors from start to finish. He ended with 10 strikeouts, while not walking a batter, a feat that had not been accomplished in a World Series for over 100 years. Overall, it was a pitching performance of historic proportions. His outing last night represented a continuation of what Lee has done the entire post season, with each performance being elevated a little bit higher as the stakes increase. He is now 3-0 with a 0.54 ERA over 33.1 innings in 4 starts. Similar to his body of work when he first joined the team, the numbers are startling, but the way he does it is even more so. He keeps batters off balance with an ever changing array of pitches, up and down, in and out. He wears a leather glove on his right hand, but it must seem like an artist's palette to Lee as he executes the master strokes of a genius. Meanwhile, Utley asserted himself as a team leader and one of the premier players in the game with his opening performance on the big, New York World Series stage. While others understandably struggled against one of the best pitchers in the majors, Utley single-handedly staked his team to a lead in a prodigious manner, seemingly putting the Yankees back on their heels while making a clear statement about his team's capabilities. 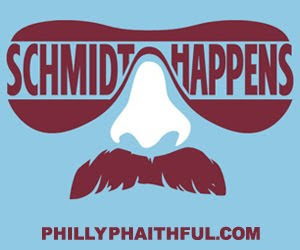 As the Phillies players were quick to remind everyone, this is only one game, but they were able to serve notice that they have a pretty special team and are not defending champions by accident. Sabathia and his Yankees mates will have more opportunities to make their own statements, but the opening salvo was fired by a Phillies team that just may be a bit under-appreciated by the national media. The Phillies are good...really, really good...and maybe the baseball world took a large step forward in recognizing that they will be very, very difficult to beat.